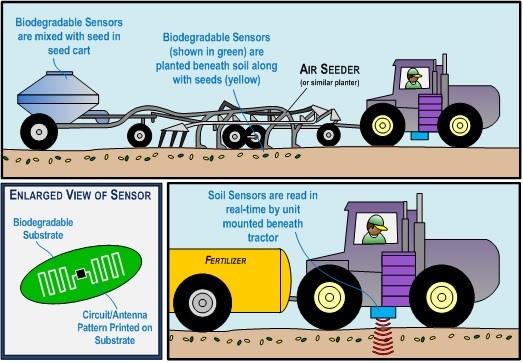 The Sensing Earth Environment Directly (SEED) sensors are self-contained, and it may be possible to deploy the sensors directly into the soil during the seeding process by mixing the sensors in with the seed mix being planted. A reading device mounted beneath an agricultural vehicle would activate and interact with the SEED sensors embedded in the soil to provide direct measurements of soil conditions, moisture, and chemical content in real time. Measures chemical/moisture content of soil to ensure optimal growing conditions. Biodegradable sensors decompose over time, with virtually nothing harmful left behind. Sensors are passive, and so no batteries (or their harmful components) will be in the soil. Small, similar in size to the seed being planted, and easily deployed across a field. Bio-based, environmentally friendly; uses materials derived from agricultural products. Information is read wirelessly in real-time using a device on an agricultural vehicle. The design of the biodegradable sensors is based on the concept of a device known as an ion-selective field-effect transistor, or ISFET. An ISFET can measure changes in ion concentration in a medium. The presence of ions in the medium will act as an electrode for the device, and the amount of current flowing through the ISFET is based on the size of this virtual gate electrode (which corresponds to the concentration of the ion being measured in the medium). Different designs of the biodegradable sensors can be created, each one specifically created to detect a different chemical (such as potassium, phosphorus, and nitrogen) or condition in the soil. Any number or combination of the sensors can then be planted in the soil in order to determine the chemical composition of the soil. US Patent No 9,961,532 "Miniaturized Biodegradable Soil Sensor"
Canadian Patent No 2,898,182 "Biodegradable Soil Sensor and Method"